Clean a little bit greener with this microfiber cleaning bar towel! This 14" x 18" white ribbed bar towel with a color-coding blue stripe reduces the amount of chemicals and water needed to keep your bar, counters, or tables clean, removing more bacteria than regular cotton cloths. Quick drying and non-abrasive, this 22 oz. 80% polyester, 20% polyamide microfiber cloth is perfect for polishing glasses, and removes water spots and dust easily. Plus, it provides lint free cleaning! This Microfiber Cleaning Bar Towels are great. We use them daily in our coffee shop. Well built and does the job. No complaints so far. We recommend them. These are ok. I think I am falling out of love with microfiber drying cloths. Perhaps its because I didnt use them for their intended purpose. Thy have held up well. No fraying at ends. You have to have a microfiber towel to clean your glasses and silverware. These are good for the price but they seem to still get lint on glasses. Great for the restaurant. We wash and reuse. They pick up a lot of water to clean the steam table wells at closing. I would buy these again. High quality Soft touch towel. Drys without a dust or stain or spot left behind it. Very easy to clean so you can reuse it for a long time. Useful towel for drying up spills wiping off tables and dirty counters. We use these all day for a range of purposes to help clean our restaurant. Love this towel and so glad webstaurant sells them! Great for soaking up spills but great for polishing also. Great towel and love that they come in different colors as well. Perfect size for all kitchen uses. Works well as a washcloth and a bleach cloth. Washes clean and doesn't hold stains. I recomend these towels. These white microfiber cleaning towels are ideal for wiping down counters and do general cleaning. Our baristas at our cafe really like them. We recommend. 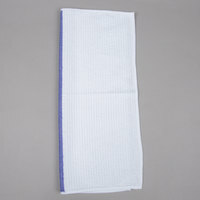 A wonderful microfiber cleaning towel with blue stripe. The towel is wonderful to clean and dry our windows. The towel is well built and strong. Perfect for all of our heavy duty cleaning. Awesome to find rags that do not leave any fuzz behind. The blue stripe helps me to recognize the rags amongst others rags and cloths. These towels wash up great with very little effort compared to cotton. Tho these will melt around kitchen grills and hot tops. No fibery mess left on glass! The are pretty good microfiber towels. We bought them due to the fibers regular towels were leaving behind on our black cafe tables. These shed less, but it still seems to leave a few white specs on our tables. But otherwise, they are nice towels to use for cleaning. These towels work really well. Super obsorbant and easy to use. The price is really affordable so we will be sure to have these on hand at all times. Not absorbent at all, and when wiping down, leave streaks. Marble and glass surfaces do not look clean after clean-up. Not even close to quality of other microfiber towels purchased in the past. We appreciate your review, Arthur! If you have any concerns about the product you purchased please contact our Customer Solutions team. Very nice towel. We use these to clean glass ware and the bar. Does not leave any fibers on anything that are hard to get off and annoying. Great all purpose towel at an even better price. The towels do exactly what they need to and have a nice blue stripe on them to distinguish their use. Honestly, I don't like the feel of microfiber in my hand, I much prefer cotton rags. However, these things are great for polishing glassware or silverware, and I pretty much use them exclusively for that task. Does not absorb liquids. May be good for polishing, but not for anything else. We bought these to cleanup coffee related spills and the towels fail to pickup any liquid. These towels were perfect. They leave no fuzzes behind and the micro fibers pick up all the dirt. It's a must have to clean stainless steel surfaces. These are only ok due to the fact that they collect lint when drying in a dryer machine. They do clean well, but look dirty after drying because it is impossible to remove ALL of the fuzz that is collected. Good for cleaning behind-the-scenes though. So much cheaper than a linen service! These really are lint free and are great for hand drying glasses. The microfiber not only dries items fast but dries fast itself. Who would've thought towels were such a good price. The micro fiber picks up all our coffee grounds and they wash really nice. Who needs linens now? these towels are the best,,, they are really good for the price, I use them almost on surface, re-washable, reusable, for sure I will keep using them and re-ordering them. I like this White Microfiber Cleaning Bar Towel with Blue Stripe, the quality is very strong and you can use for all the purpose, i don't suggest for glasses. These are my favorite clean up towels. Use them slightly damp, they are great every surface even glass. I will absolutely be buying these again. Nice microfiber towels. Love these for window cleaning and lots of applications that require polishing, etc. Good price and nicely made, will buy more for sure. These towels melt under hot temperatures. I, like many chefs, use my towels as pot holders as well. This material is not made for this, as I have learned! I will only buy 100% cotton towels moving forward. Great towel. We use this for cleaning our food truck. They are soft and very sturdy. We will order these again once they are needed. I like these a lot, I just think "large wash cloth" instead of "towel" as they are not quite as big as expected. They do clean really well and are easy to launder. Love these!!! Great product, thick and soft. I use it in the kitchen, in bathrooms and soft enough to clean toddlers cheeks. Great quality for the price. OK love these towels, super adsorbent, use slightly damp and they work wonders for counters with crumb/particle clean up. They also work great for drying and cleaning up spills and messes, and although I have had issues using them for drying dishes due to lint, that is probably due to not breaking them in yet. Nice quality towel for a bar/kitchen atmosphere. However, when washing them...they do tend to stick together to everything. Wouldn't stop me from using them though! Prior to purchasing these towels, I had only ever used microfiber cloths for dusting. I now see how useful they can be in the kitchen. These towels are super absorbent so they dry dishes and clean up spills better than any other. I've had microfiber cloths in the past that have pilled badly after a few washes... These have not (after a half dozen washes or so). They look just as good as the day I received them. I use these towels in my kitchen every day. They are great for drying dishes, polishing glasses, grabbing things out of the oven, and wiping up. Another winner! The micro fiber cleaning bar towels are super affordable. They stand up to many washes so they last longer than most dish towels that I have used.